Description: Good variety with a mix of slope and hazards. 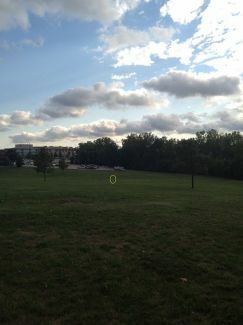 Large gully to the right of 1-5 is a disc eater. Lots of poison ivy and stinging nettles. Local Directions: I-29 to Hwy 36 east. At 1st exit, go left on Riverside Rd. to another left at 3rd light (Mitchell Ave.), half mile to college on the right. Course is next to football field at back of campus.